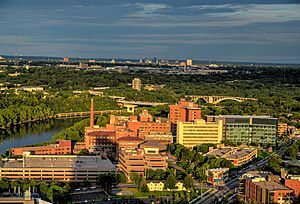 Cedar-Riverside, also referred to as the West Bank, is a neighborhood within Minneapolis, Minnesota. Its boundaries are the Mississippi River to the north and east, Interstate 94 to the south, and Hiawatha Avenue and Interstate 35W to the west. It has a longstanding tradition of cultural diversity and settlement, with a robust arts tradition. 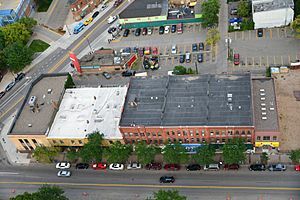 The Cedar-Riverside neighborhood is historically known for its immigrant population, beginning in the late 1940s post-World War II with immigrants from eastern Europe. With the arrival of many new Cambodian, Somali, and especially Latino immigrants, hospitals now also offer services in other languages to accommodate patients whose mother tongue is not English. 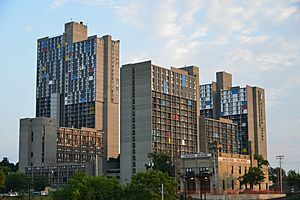 The neighborhood is also home to Augsburg College, a private liberal arts college and St. Catherine University's Minneapolis campus. In the late 19th century, Cedar-Riverside had a sizable Scandinavian immigrant community, most of whose members labored in the Mississippi River's lumber and milling industries. It later evolved into a hub for intellectuals, hippies, radical activists, actors, musicians and artists during the 1960s and 70s. In keeping with its tradition of ethnic and cultural diversity, the neighborhood is today home to the largest immigrant community in the Twin Cities. 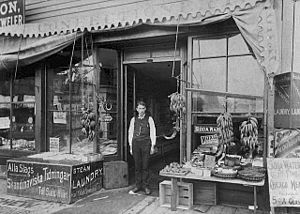 There was Samuelsen’s confectionery and soda shop, Hagen's appliance store, Moberg’s Norwegian deli, and a host of other Scandinavian-owned businesses. On Cedar Avenue was Dania Hall, where the Danish community would meet. An eclectic mix of Gothic and classical styles, the building included a dining hall and kitchen in the basement, commercial space on the first floor, offices for the Society of Dania plus billiard and reading rooms on the second floor. A theater/assembly hall on the third and fourth floors featured Scandinavian vaudeville acts and weekend dances. On the corner next to Dania Hall was the Breezy Point Tavern owned by Oscar Carlsen, a Norwegian immigrant from the turn of the 20th century. Oscar had come to Minnesota to work in the lumber camps. 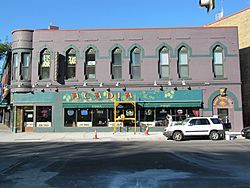 Additionally, the West Bank music scene is known as a catalyst for major musicians, such as Bonnie Raitt, Leo Kottke, Butch Thompson (Jazz Originals), Peter Ostroushko (Prairie Home Companion), Dave "Snaker" Ray (Koerner, Ray & Glover), Erik Anderson (The Wallets), Sean Blackburn (Prairie Home Companion), Bill Hinkley (Minnesota Music Hall of Fame), Karen Mueller (Autoharp Hall of Fame), and, to a lesser extent, Bob Dylan. Many of these musicians also taught, performed and/or jammed at the West Bank School of Music. The Cedar Cultural Center, Cafe Extempore, Scholar Coffeehouse, New Riverside Cafe, Viking Bar, 400 Bar, 7 Corners, Whisky Junction, Cabooze and Cedarfest have likewise all been popular music venues in their time. 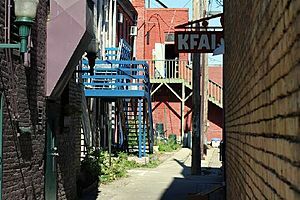 Established in 1978, KFAI community radio has broadcast a mix of community talk radio and folk and avant-garde music from around the world from the Bailey building since 1991. The arts flavor of the area is enhanced by the presence of Augsburg College and the University of Minnesota's West Bank Arts Quarter, which is home to the University’s arts programs. Cedar-Riverside, Minneapolis Facts for Kids. Kiddle Encyclopedia.